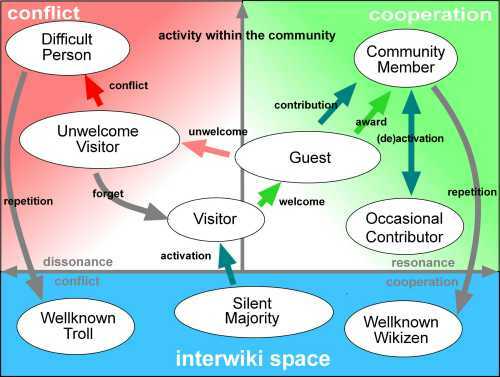 This is a suggested minimal model of the roles in an online community, defining roles and transitions between roles. The purpose of the role model is to build trust beyond individual interactions. The roles define acceptable behaviour and expectations in a kind of objective way. People are able to observe and compare. It's easy to stay within the boundaries of roles, thereby build trust, advance within the community and choose a fitting role. It's much easier than without a role model. Therefore a role model is not about restricting freedoms. You can compare this to a system of roads. Typically we see roads as an advantage, because we can reach our goals faster than without them, although we are not as free to choose our way as (without roads) in the wilderness. To observe and design a sensible or workable role model may mean to build social highways. Note that such a system is not hierarchical in nature. It may contain a hierarchy (for example different types of members) but it needn't. Within most online communities such a role model would reduce hierarchical phenomena, because a system of peers (members) is able to replace the natural hierarchical system of powers (owner, founder/host, more or less trusted people).